Peter Prater, managing director of Hexagon Safety & Infrastructure and the founder and chair of the International Critical Control Rooms Alliance (ICCRA), says we are in an unusually busy period of technology disruption, “with advances in many areas being drawn together for new third-generation command and control solutions”. He adds that typically after a lot of technology is harnessed and implemented by industry, “there’s a hiatus for a few years while those [bed down] and then new advances mature to the degree they can be introduced to critical control solutions – that’s kind of where we are now”. One of the biggest factors is the changing expectations of control room operators, citizens and other stakeholders – “that’s why we’re having to adopt new technologies faster and faster – [it’s] to try to keep pace with the changes [taking place within the mobile phones] in our pockets”. Mike Isherwood, APD Communications managing director, highlights the fact that non-verbal forms of communication (such as email, texts and web forms) now account for a significant percentage of the interactions between control rooms and the public. While live web chat accounts for only a small percentage, “over the next three to four years it will become more prevalent, email will slow down and contact via Twitter and Facebook will remain relatively steady”. He adds that this trend is driving an increase in the demands on control rooms, as people who would never contact one over the phone are now doing so by other means, though Isherwood also notes that as these additional queries are often not time-critical, they can be easier to manage – “no-one is going to send you a message to say that their house is on fire, they’re going to call”. Isherwood notes that control rooms will need to cater for young people and their preferred communication methods. He also cites the growing adoption of smart home devices, CCTV, connected burglar alarms and similar devices – “by 2021, those kinds of devices will outnumber smartphones and those kinds of technologies will be reporting things, not necessarily directly to the emergency services, but certainly via third parties”. This rise in non-emergency calls is quite troubling for operators, as they have to accommodate them without it impacting on their ability to answer emergency calls. Organised crime does not respect regional and national boundaries. In the UK, this was recently brought into focus in an article in The Guardian, titled ‘Organised crime in the UK is bigger than ever before. Can the police catch up?’, which was largely based on an interview with Lynne Owens, head of the National Crime Agency (NCA). It is well worth a read, particularly her assertion that a fragmented policing model has left Britain with little or no “capability to respond” to modern global criminals. While some would expect this to prompt further consolidation, the reverse is occurring, as seen by the imminent end of Warwickshire and West Mercia police’s strategic alliance. This ‘divorce’ has created an unusual situation for Saab, as it will require a single deployment of its SAFE command and control system operating over two separate control rooms to be “pulled apart”. Robert Nitsch, vice-president of public safety at Frequentis, highlights the work of research project EPISECC (Establish a Pan-European Information Space to Enhance seCurity of Citizens), which ran from June 2016-November 2017 with a future integrated crisis and disaster response capacity in mind (see https://episecc.eu). Control room operators face something of an uphill struggle, perhaps made worse by the way public finances have been stretched. Fortunately, the vendors that support them haven’t been idle. Hexagon’s Prater says his company recognises that given budgetary constraints, “it’s incumbent on vendors to help customers be more self-sufficient where they wish to be so, and to that extent we’re trying to give them more self-service tools in our next-generation solutions”. There is also the shift away from control room operators having to continually act as the bridges between software packages through time-consuming copy and pasting. 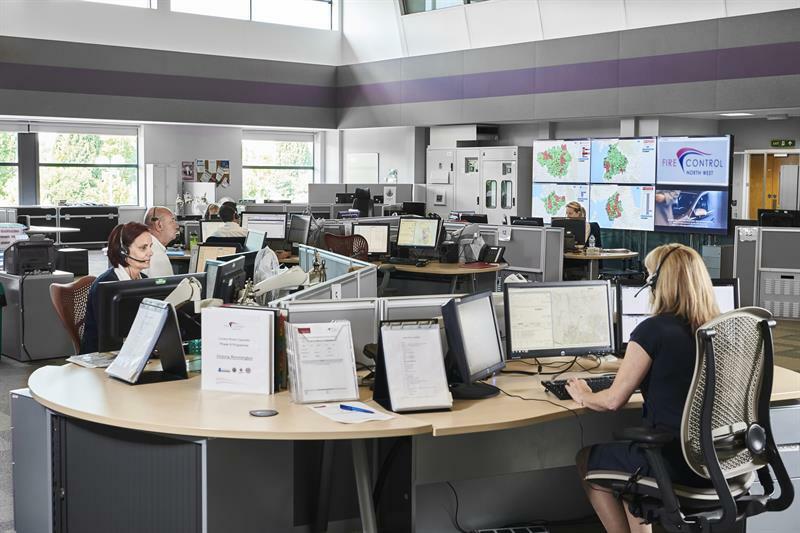 I recently visited Lincolnshire Police’s control room, which will be the first in the country to migrate to Motorola Solutions’ cloud-based integrated CommandCentral Control Room Solution (CRS). This as a unified and highly scalable platform that integrates multiple functions is expected to eliminate the need for this kind of drudgery, freeing operators to perform more high-value tasks and increase the number of calls that are addressed in one session without the need to involve or deploy police officers. As operators can be blitzed by massive amounts of data from a variety of sources – including video and social media feeds – many vendors are working to ensure they only receive relevant information in an easy-to-digest and intuitive way. Prater gives another example. “Our new user interfaces are designed by users for users, and having analytics embedded seamlessly in the workflows helps provide real-time situational awareness.” Hexagon is also working to use machine learning to make sense of the input from sensors out in the field and provide the operator with commentary that supports their decision-making. An end to dark sites? Boswell says while “a lot of people assume that there are huge cost savings associated with cloud”, these only occur when the organisation has very unpredictable and spiky irregular demand for resources. “If you want to use cloud resources 24/7, 365, it becomes a more complex economic formula.” He adds that “a lot of organisations are still nervous about data in the cloud, but are less so about pushing anonymised data to cloud-based services for analysis”. Returning to my visit to Lincolnshire Police, Andrew White, assistant chief officer, explained that the force’s back-up control room is only around 200 yards away from the main site, “so should anything happen to this location, our ability to carry on operating would be severely comprised”. In contrast, the new Motorola solution will be accessible via a web browser, allowing a control room to be set up in any location with an internet connection. He believes there needs to be separation between the front-end applications handling the workflows and the systems handling the data in the back-end – “too often people silo those things”. We have seen that while control room operators are increasingly having to deal with non-urgent matters, the vendors that support them are working hard to make their systems more intuitive and flexible. If the latter leads to the technical barriers that have frustrated data sharing in the past being no longer an issue, it will be interesting to see if end-user organisations take full advantage, as part of the wider effort to tackle organised crime.